This book addresses a misunderstanding from the philosophical point of view, that has arisen from time to time, about the First Noble Truth. In this succinct essay Vipassana Acharya S N Goenka both untangles this philosophical confusion and also explains that the teachings can only be appreciated at the direct experiential rather than the intellectual level. Understood in these lights the teachings of the Buddha shine out as teachings of real happiness. 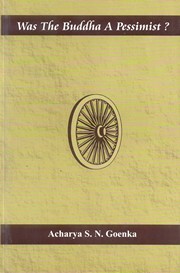 Originally composed in Hindi to address philosophical issues prevalent in India, particularly in the 20th century, this translation into English will help to alleviate the perplexities also of those outside of India for whom this question has arisen. Does a Doctor Promote Disease? Was the Buddha an Extreme Pessimist ? Title: Was The Buddha A Pessimist?